David Finnigan has had a number of run-ins while working on his controversial new play about climate deniers. Here, he argues they fall into one of a few camps. New One Nation Senator Malcolm Roberts covers all the bases: the conspiracy of the United Nations, climate change is a hoax, and of course, the Jews. 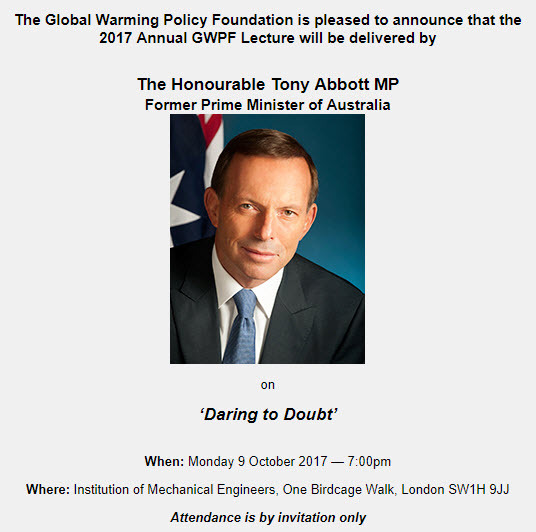 Despite all evidence to the contrary, Tony Abbott's business guru Maurice Newman is still convinced the world is cooling. Here's some facts to add to his case. George Brandis is once again standing up for those who need it least. Plus whether we should get rid of private school funding and a political candidate with some horrific views on domestic violence. Crikey readers talk climate deniers, vote counting systems and who is piloting the move to Badgerys Creek. Any conference worth its salt needs a nice long list of sponsors to give the impression of widespread diverse support for whatever the conference organisers are advocating, writes freelance journalist and blogger Graham Readfearn. New research provides some intriguing insights into why, and what sort of, conservatives oppose climate change and distrust scientists, explains Noel Turnbull.